deck | Odd Job Handyman Services, Inc. The month of March is upon us, and the temperature is finally rising. So you know what that means: it’s finally time to start tackling those outdoor Spring Home Improvement projects! 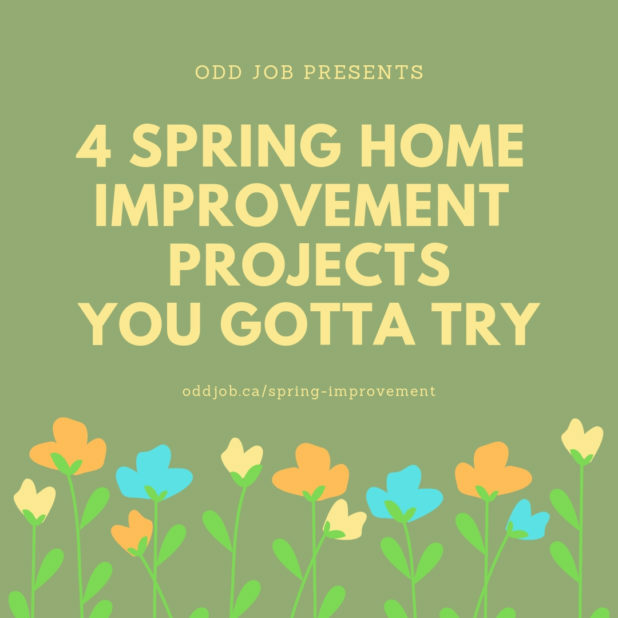 HGTV notes that making even small improvements can dramatically increase the value of your home, and Spring is definitely the time to get those done. Here are 5 small jobs you can do to make your home look as good as the warm weather feels. 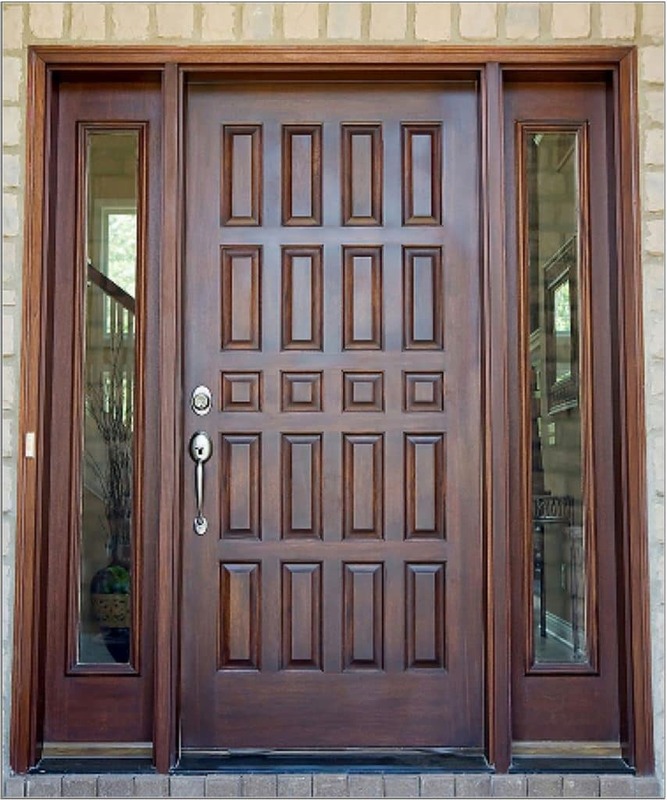 A new door is an instant improvement, and provides value year-round. But the best time to install one is as part of your Spring Home Improvement schedule. Adding a new door will give you some serious new curb appeal, and you can even paint it red to show the world that you’ve paid off your mortgage. What better way to enjoy the returning sunshine than by sitting out on your backyard deck? This Spring Home Improvement tip is a double-whammy: not only does a new stain on that old wood look great, but it’ll protect your deck throughout the entire year. 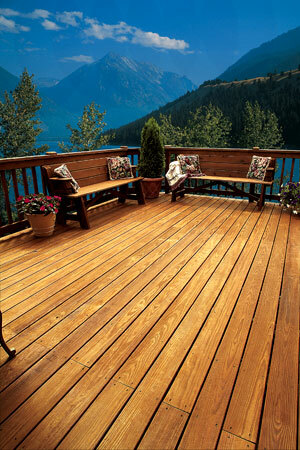 Staining your deck is a quick, affordable way to enhance your backyard. Most staining jobs are done in about 3-4 hours and won’t cost over $500. You should also look into giving your deck a power wash. Constant outdoor exposure can take a toll on the wood, and make repairs more costly and frequent. 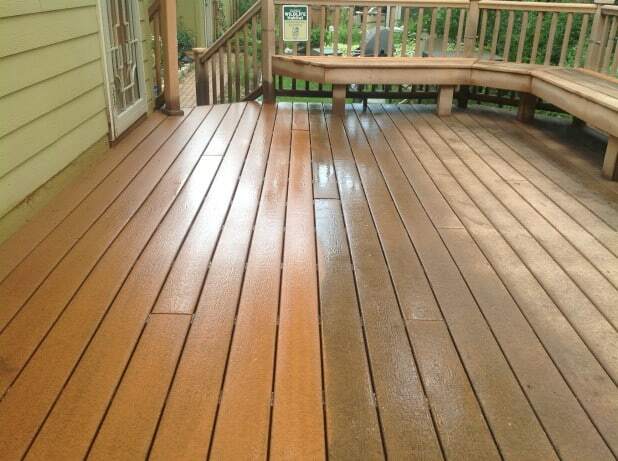 A power wash can blast away the dirt and grime that can cause permanent damage to your deck. Check out this before and after video to see how a simple power wash can make bring your deck back to life. Good fences make happy home owners. There are a lot of sayings about fences. One can even “sit on the fence” with one’s opinion. With all of this activity happening around your fences, you might want to make “fence improvement” one of your Spring Home Improvement projects. So, on the first sunny weekend this month, go out and take stock of your fence. Are there any broken boards? And how are the posts holding up? Even if your fence is in good repair, it’s a good idea to paint your fence again, and give it a refreshed look. Just because it keeps things out doesn’t mean it can’t be welcoming. If you’ve got a garden, lawn, or one of those tiny little kiddie pools, you’ll be using your hose a few times this Spring and Summer. But if you don’t have a hose storage solution, you might not even want to bother watering the flowers. Odd Job handyman has got you covered. 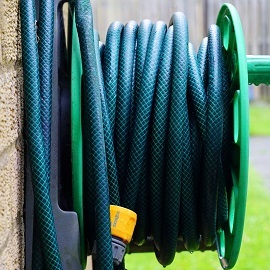 An outdoor hose reel can be mounted to the side of your house for easy storage. So there’s no more struggling to wind it back up after use, and no more hose on the ground. See a video about it here. Can you think of any more Spring home improvement projects? Get an estimate from Odd Job today! It’s the time of year when people would like to be biking, hiking, or just relaxing on the deck with friends and enjoying the lovely evenings. If you’re like many, however, this last seasonal activity is impossible because of its shabby condition. You aren’t alone. The combination of frequent human activity, constant exposure to the elements and the passage of time is enough to cause even the best deck to wear out. Even once the most pressing problems have been dealt with and you’ve made sure that it is both structurally sound and generally free of blemishes, you’re still left without what you had first envisioned: your outdoor space as beautiful as it once was. It’s time to apply a new finish, and the team at Odd Job has some great tips for you. 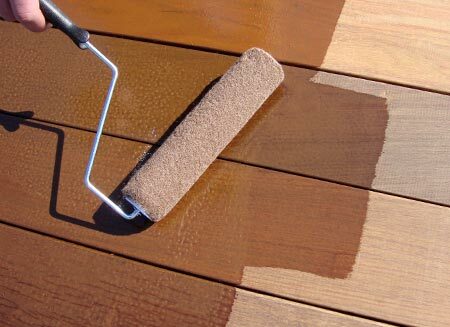 The most difficult and important part of refinishing your deck is preparation. Strip it using a water soluble agent and then pressure wash it to completely do away with the old finish. After giving it a couple of days to dry, it will be time to sand it and deal with those pesky surface fibers that were raised when you first washed it. Washing and sanding is about more than simply cleaning the wood. It’s about maximizing its absorbency. The more absorbent the wood is, the longer the new finish’s lifespan will be. The problem is that most wood isn’t very well-suited for outdoor finishing projects. New, planed lumber has been so thoroughly polished that it won’t absorb your finishing product very effectively. Conversely, old wood is very absorbent but it’s surface fibers are already somewhat loose and a new finish will pull them off. The result in both cases is premature peeling. So what is the solution? The world’s largest manufacturer of finishes, Akzo Nobel Coatings, conducted a five-year study to find it. After field trials in Canada and the United States in which various water-based and chemical-based agents were tested, Akzo Nobel concluded that a bright wood surface prepared with a 60-80 grit abrasive powered by a walk-behind, square-buff floor sander produced the greatest level of absorbency and durability. When they tried an 120-grit abrasive, they were surprised to find that the absorbency of the wood was reduced by 30%. Now comes the fun part: it’s time to decide what you want your deck to look like. Who ever thought that refinishing your deck could be fun? Every chore is an outlet for creativity if you allow it to be. Consider the different finish products that available to you. Right now there are four main types, all of them with their own pros and cons. The one you decide on will not only determine the appearance of your deck, but also how long it will last and how it should be maintained. If its most serious problems are a few cracks resulting from weather conditions, soak-in stains may the solution. They won’t produce a surface film, but will take care of the cracks and seal out water. Those who are mainly concerned with aesthetics might want to consider a translucent, varnish-type finish. 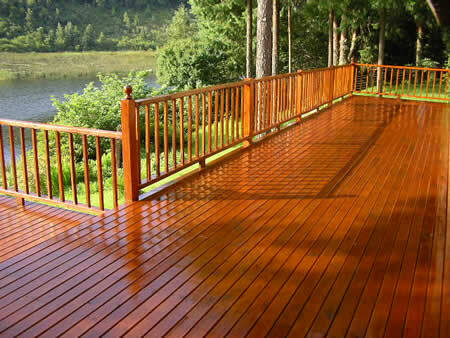 A quality finishing product will leave your deck looking like a brand new table. Maintaining this will be very difficult though, as this type of finish needs to be completely stripped and reapplied around every three years. If you don’t have the energy or the funds to do this, or you’re more concerned with your deck’s durability than its outward appearance, an opaque, paint-style finish might appeal to you. They almost completely obscure the wood’s natural appearance and thus may take away some of the rustic charm, but will last for about five years. This makes them the most durable of any of the finish products discussed here, and this is due in part to their great resistance to abrasion. If your space sees a lot of foot traffic, an opaque finish may be the product for you. There are also clear water repellants, which help protect your deck from moisture and the problems, such as warping, splitting, and cracking, that it causes. High quality products of this type will yield a crisp, fresh look, but you will need to strip, lighten and reapply the finish every 12-18 months. Furthermore, these finishes don’t repel dirt nearly as well as they repel water. Mark Knaebe, a surface chemist at the U.S. Department of Agriculture’s Forest Products Laboratory in Madison, Wisconsin, has recommended products based on paraffin oils and preservatives as the most effective clear water repellants. 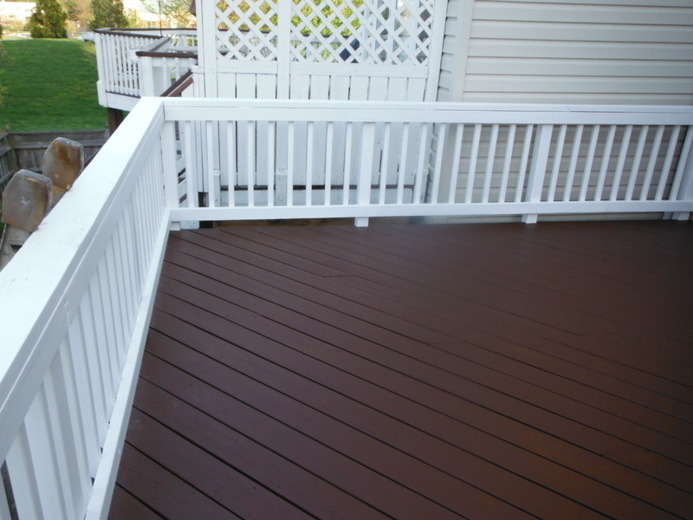 Refinishing your deck can be treacherous, and it can be very difficult for the DIY enthusiast. The preparation is even more important than the final steps, and making a mistake during either can cause the entire project to go sideways. Odd Job Handyman Services counts deck maintenance among its specialties, and we would like to help you reclaim your outdoor space. As the days get warmer and warmer, you shouldn’t settle for stains, cracks or anything else that lessens the enjoyability of your space. Dial 416-520-1161 or just take a minute to fill out our nifty online form and within no time members of our highly-qualified team of professional handymen will begin the process of restoring your old dream deck to all of its former glory.